Heather's maternal Grandparents were Salvation Army missionaries who served in Korea, India, South Africa and Rhodesia before returning to the UK. Mavis was born in Korea. Charles Sylvester and Nellie Harling had eight children. The eldest of these, Douglas and their third child, Gordon died in a smallpox epidemic in 1919. Charles died in 1953 (meaning that Heather never knew her maternal grandfather) and Nellie lived with Bernard and Mavis in London and Southampton until her death at the ripe old age of 85. 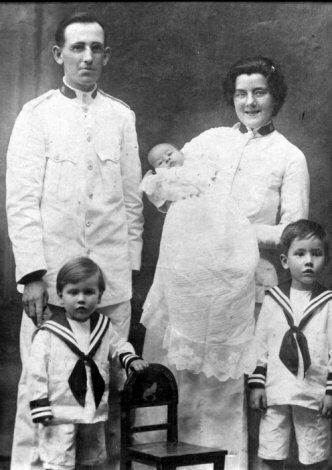 In the photo (left) which can be enlarged by clicking it they are seen in 1919 with their first three children - on the left is Bram while on the right and in Nellie's arms are Douglas and Gordon who died a few months later from smallpox. The Sylvester family - left to right: Joan Nelson (Olive's daughter), Mavis Whybrow, Bram Sylvester, Olive Nelson (McKirdy), Charles Sylvester, Frank Sylvester, Nellie Sylvester, Joan Perry, Dids Sylvester, May Horwood, Michael Alexander McKirdy. Several of their children followed them into Christian Ministry via The Salvation Army officers: Joan is married to Lt Col. Geoff Perry a noted Army writer and poet and Bram is also a Lt Colonel. May is a retired Brigadier. Frank was an officer for a while but, although leaving the full-time ministry he remained a loyal Salvationist throughout his life. The Family at Mavis & Bernard's 40th Wedding Anniversary 2001. Back row(standing) left to right - Barbara Richards, John Sylvester, Geoff Perry, Tim Stone, Marc Harry, Martin Whybrow, Bernard Whybrow, Frank Sylvester, Michael Whybrow, Keith Perry, Bram Sylvester, Charles Sylvester, Jack Horwood, Ian Richards, Robin Guest, Tessa McKirdy (in front of Robin), James Pollock, Sharon Pollock, Miranda Whybrow, Sue Sylvester, Gillian Pollock, Katherine Pollock, Angela Whybrow. Front row (seated) - Jean Whybrow, ?, Heather Harry, Mavis Whybrow, Marjorie Whybrow, Cheryl Stone (with Zara Stone), Emma Whybrow (with Bradley Stone), May Horwood, Joan Nelson, Joan Perry, Dids Sylvester, Manuela (with ? and ? ), Iris Sylvester. Kneeling (front) - ?, Morgan Harry, Lewis Harry, ?, ?, ?, ?, ?, Lara (Barbara's daughter). Lt. Colonel Bram Sylvester (1917 - ) was married to Dids. They lived in retirement in Blackpool until Dids died in 2005. They had one son, called John. Olive (1926-95) is pictured left, 2nd from left at Marc and Heather's wedding. She was married twice, firstly to to James McKirdy. Their children Alec (Mike) and Joan are also in the picture. Joan is next to Olive (wearing a white jacket) and Mike is standing at the back (with a beard). Joan lives in Denmark while Mike sadly died from cancer shortly after his mother in 1996. 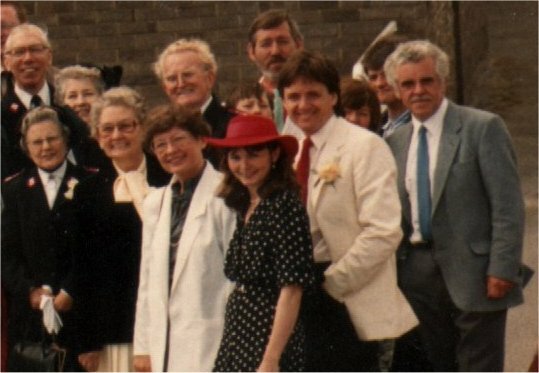 Olive had later married Bill Nelson and their son Gordon is on the far right of the photo. May (1923 - ) was also a Salvation Army officer. She married Brigadier Jack Horwood (1923-2001) in 1979. May is on the left of the picture above while Jack is behind Olive and Joan. Jack was widowed twice while on Missionary Service with the SA and met May (who had actually been a bridesmaid at his 2nd wedding!) while overseas. Jack had three children, Douglas, Jackie (who lives in South Africa) and Natalie. Sadly, Jack died in July 2001 having taken ill just a short while after Mavis and Bernard's 40th wedding celebrations. May lives in retirement in Southampton near to Bernard. She still attends the Corps at Shirley. Natalie has Down's Syndrome but has a lovely personality and bright outlook on life. I was so pleased to hear that, to my great surprise, she got married in 2006. Frank (1926 - 2003) was also a Salvation Army officer for a while but not for his whole career. He married Iris Blake (who already had a daughter, Barbara) and they had a son, Charles. In the upper photo above Frank is standing 8th from the left while Iris is seated on the far right. Frank died from cancer in 2003 and Iris died in 2004 having been extremely ill for a long time after suffering a cerebral haemorrhage in Autumn 2001. Barbara (above, in red hat) is currently the Songster Leader at Worthing Citadel Corps. She is a music teacher and is now married to Ian Richards. She was formerly married to Kevin Burton (who was guitarist with the Salvation Army's follow-up group from the Joystrings - Good News). They had three children: Ollie, Ben and Lara. 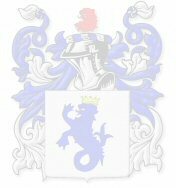 Charles is married to Sue and they have two children Eliot Joe and Sasha. They live in Hampshire and attend Staines Corps in the Salvation Army. Iris's brother is Major Eric Blake, another Salvation Army officer. 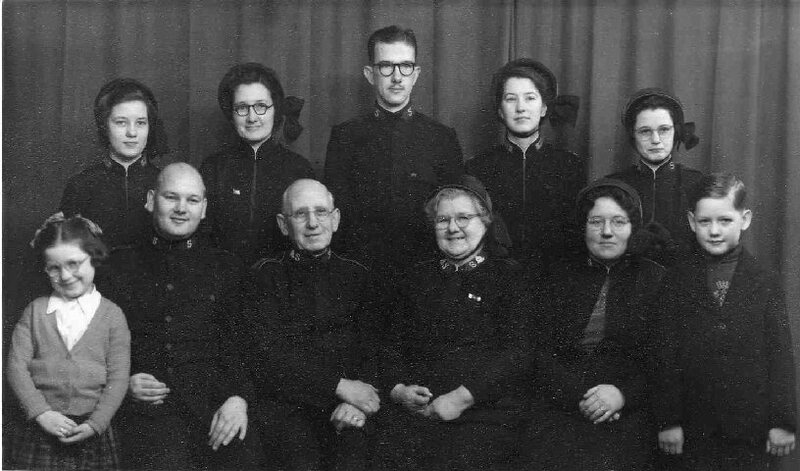 Joan (1931 - ) is yet another Salvation Army officer. She lives now in retirement in Ilford with her husband Lt Colonel Geoff Perry, a noted Salvation Army writer, poet and lyricist. They are on the photograph directly above behind May (on the left) and on the upper picture Geoff is standing 3rd from the left and Joan is seated 4th from the right. Joan and Geoff have three children: Gillian, who is married to James Pollock (they have 4 children called Sharon, Katherine, Jonathan and Maria), Renton, who is married to Ann-Marie, (they live in Switzerland and have 2 children Philip and Damarus) and Keith who is married to Manuella (they have 4 sons - David, Samuel and the twins Michael and Andreas. Mavis (1934 - 2004) the youngest Sylvester child married Bernard Whybrow, of course!